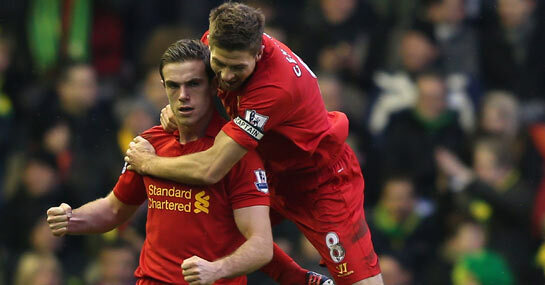 Brought to Liverpool by Kenny Dalglish for a pretty penny back in 2011, there was a time not so long ago that the name Jordan Henderson was the source of serious lampooning by Reds fans for his indifferent performances. This perception, however, has gradually dissipated and now it appears to have been fully flipped 360 degrees. The news emerging from Anfield is that Liverpool have begun the process of extending Henderson’s current contract, which still has two years left to run. Given Liverpool face Arsenal next in a Premier League game of bona fide crunch – where the hosts are labelled the slenderest of 23/20 favourites to prevail – the timing of the talks is also significant. The fact of the matter is that to his enormous credit, the former Sunderland man has transformed himself from a figure to poke fun at during his first season, to one of Liverpool’s standout performers of a fantastic campaign to date. Cited as one of the brightest English midfield talents by Dalglish back in the summer of 2011, despite only two seasons in the Sunderland first team, the pressure on the then 20-year-old’s shoulders was cranked up with a reported £20m price tag. Plainly feeling like a fish well out of the drink at Anfield, it didn’t take long for Liverpool fans to take issue with his hefty price tag and many even called for Henderson to be sold at the end of his first season in 2011/12. Thanks to Brendan Rodgers’ management though, Henderson really hit a groove from January onwards last season and having been installed in the starting line-up from the word go this time, he’s flourished. Henderson’s energy, subtlety and accuracy of distribution with the ball in central midfield have been integral in Liverpool’s top-four bid – rated at 4/7 – and a new contract is just rewards for this remarkable turnaround.